Pro-Found Software, Inc. led a $1.5 million project to create a customer service web-based portal for Global Crossing, an international telecom firm. The year-long project, completed on time and within budget, required us to integrate to existing systems (billing, trouble ticket, etc. ), and to create a user-friendly web-based presentation layer for data entry and reporting. A critical requirement of this project was integrating multiple billing systems, two of which were legacy systems (AS/400, VAX) which Global Crossing inherited in the course of previous mergers. It was decided to build the portal using the existing billing systems while searching for a single new system to satisfy all billing needs. Pro-Found led the effort to select the new billing system from among the leading vendors including SAP, PeopleSoft, Kenan, etc. Pro-Found was responsible for the entire life-cycle, from requirements analysis through design and implementation. 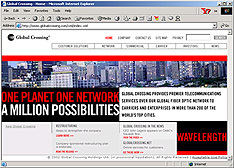 The system, hosted by Global Crossing, was designed to support 3,000-5,000 simultaneous users. We trained Global Crossing to be self-sufficient, and they maintain the system with minimal assistance from us.